When you see a sign that says Tea+Booze+Coffee+Food you can’t just walk on by. I mean, I suppose you could, but why would you? A few weeks ago a friend and I stumbled upon this establishment. I immediately begin asking questions, how can I not? As they are explaining everything from Tea lattes to coffee drinks with alcohol, theirs or your own concoction, I started to see food go by. By that I mean, good food go by. Biscuits and gravy and an egg scrabble in a cast iron skillet. 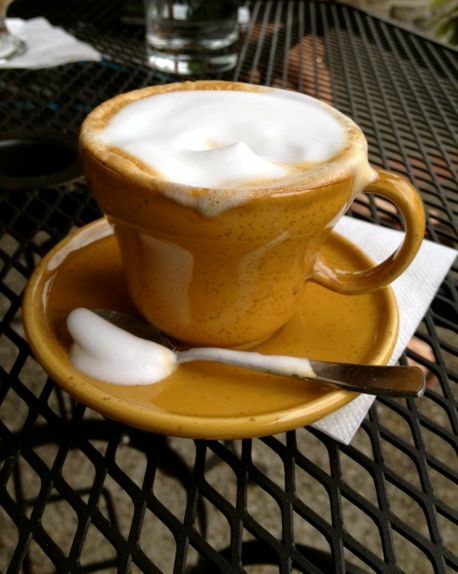 That day I told them to make me some kind of tea latte. I like surprises and I’m good with trying something that they think is the best. You never know when you will find some great new thing. Well, unfornuately that wasn’t the case with the tea latte. I think I decided I like my lattes with coffee. I didn’t hate it, I just realized it wasn’t for me. Now I have a friend that swears by them, so give them a shot. Well, we had a lazy Sunday afternoon with no kids so I grabbed my husband and said you need to try this place. All I had to say was coffee and booze, he was in. When we got there I remembered seeing some faces that I had seen just a few weeks ago. One gal even remembered exactly what I ordered and she also knew that I didn’t love it. Wow! Again being the brave soul that I am I asked for a coffee drink with alcohol and I also wanted something that was unique to them. The gal behind the counter was very excited about the challenge. My husband on the other hand looked over the menu and ordered something that looked appealing to him. We went outside and sat in the warm sun, people watched and waited for our drinks to arrive. I can’t even remember what she made me because, like I said, it’s not even on the menu. It had an anise alcohol in it, which scared me a little, because I don’t like anise, but the flavor was so unique and flavorful that I loved it. We still have not eaten here, but I wouldn’t hesitate to try anything. I did talk to one of the guys the first day that said they make the food in house. It’s not just heated up coffee house food. My husband was also pleased with his coffee with bourbon. I mean really, how can you go wrong? The atmopshere here great. It’s an old house with many tables and great 2 level seating outside. The prices are a little less than you would pay for a cocktail anywhere else. You’re really missing out if you don’t try their food — BRUNCH IS THE BEST EVER!! Original, scrumptious dishes and best yet — no waiting!!! 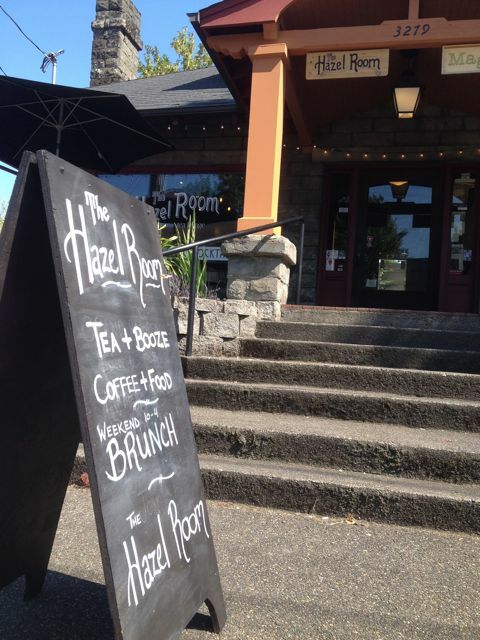 The Hazel Room needs to be listed in your brunch section. Skillet dishes for everyone, vegan, gluten free – biscuits and gravy to die for. Lunch is equally as good — Brie and Pear soaked with Maple Syrup on a Baguette OMG!!! Sssshhhh…. maybe we shouldn’t say anything and keep it a secret !! I know we need to go back and give it a try. What I saw coming out looked fabulous!